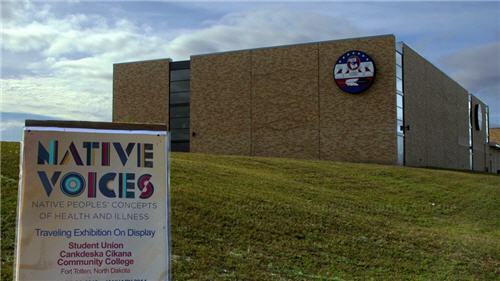 After four months in the heart of North Dakota’s Indian country, the exhibition, Native Voices: Native Peoples’ Concepts of Health and Illness, is now on display in Alaska. 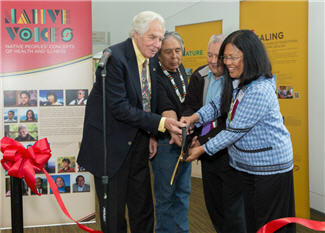 The National Library of Medicine exhibition opened June 9 in Anchorage as part of the National Congress of American Indian’s mid-year conference. 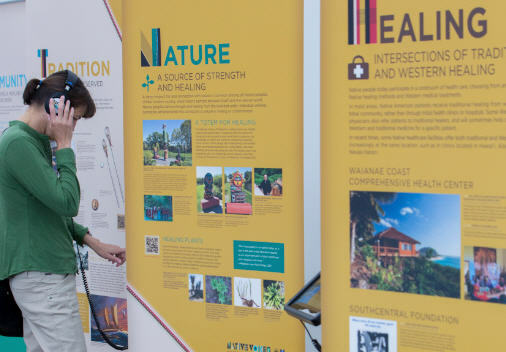 “The Native Voices exhibition puts the strengths and enduring wisdom of Native medicine into the national spotlight,” says Katherine Gottlieb, president of the Southcentral Foundation, an award-winning Native Alaskan Medical Center that is featured in the exhibition. The foundation presented NLM Director Donald A.B. Lindberg, MD with a special award for fostering education about Native American health and illness through the exhibition. Native Voices features interviews with more than 100 Native American, Alaska Native, and Native Hawaiian tribal leaders, physicians, tribal healers, students, clergy, and other health care professionals. The interviewees span urban and rural areas and represent more than 50 different tribes and pueblos from across the US. The exhibition opened in the rotunda of the NLM in 2011. There’s also an online version; a free iPad version; and the newest addition, the traveling version. Alaska Native Heritage Center in Anchorage (June 13-September 15). Southcentral’s main hospital, Anchorage Native Primary Care Center (October 6-November 9). Southcentral’s Benteh Nuutah Valley Native Primary Care Center in Wasilla (mid-November-December). Washington, Wyoming, Alaska, Montana, and Idaho School of Medical Education at the University of Alaska-Anchorage (January-March 2015). In the days before the North Dakota opening, members of the Spirit Lake Dakota Nation had the chance to add their voices and share poignant, personal, stories of healing and hope through a companion project. Eight people learned the art of digital storytelling from Brenda Manuelito and Carmella Rodriguez, co-founders of nDigiDreams, a consulting and training company. With their “hands and heart,” as Manuelito says, participants crafted scripts, provided pictures, voice and music, and edited them together under nDigitDreams tutelage. While the traveling exhibition has left the college, the college Web site still hosts the Spirit Lake stories. In the coming months, NLM plans to launch a Native Voices traveling exhibition blog that will give people a new opportunity to share their stories and spotlight their communities. Information compiled by Shana Potash, NLM in Focus editor and Robert Logan, PhD, NLM Senior Staff. July 15, 2014 in Events, Products. ← NLM Virtual Internships: A Great Learning Experience and No Commute!